The Clayhanger Guest House is a Victorian town house offering bed and breakfast accommodation situated in the historic market town of Newcastle-under-Lyme in Staffordshire. All of the ensuite rooms have their own fridge and all standard rooms have access to a communal larder fridge on their floor. Breakfast is served in the Victorian style dining room where a wide variety of breakfast is available. There is a vegetarian breakfast available and if you have any special dietary requirements let the owners know in advance and they will do their best to accommodate you. Clayhanger is only a short distance from the Potteries Shopping Centre and even closer to the Festival Park. You will find shops, restaurants, and entertainment venues such as 10-pin bowling, cinema, and Waterworld. Ceilidh Bed & Breakfast can be found in the town of Lossiemouth in Morayshire. Our B&B conveniently situated between two bus stops and close to restaurants, bars and shops, the Moray Golf Course and the beautiful east beach. Our guest bedrooms are designed to enhance your stay. All bedrooms are en suite equipped with Freeview TV’s with text & DVD players, Fair trade hospitality trays, mini-fridges, hairdryers, free Wi-Fi. For guests not accustomed to our long summer days, all rooms have black out blind, all to make you stay at Ceilidh a comfortable experience. Just 6 miles from Elgin; Lossiemouth ‘the jewel of Moray’ lies in the path of the Gulf Stream blessing the town with a temperate climate making our wonderful countryside more enjoyable. Experience our wonderful costal and countryside walks watch the huge diversity of wildlife or take in our heritage on the Castle or Whisky trails. 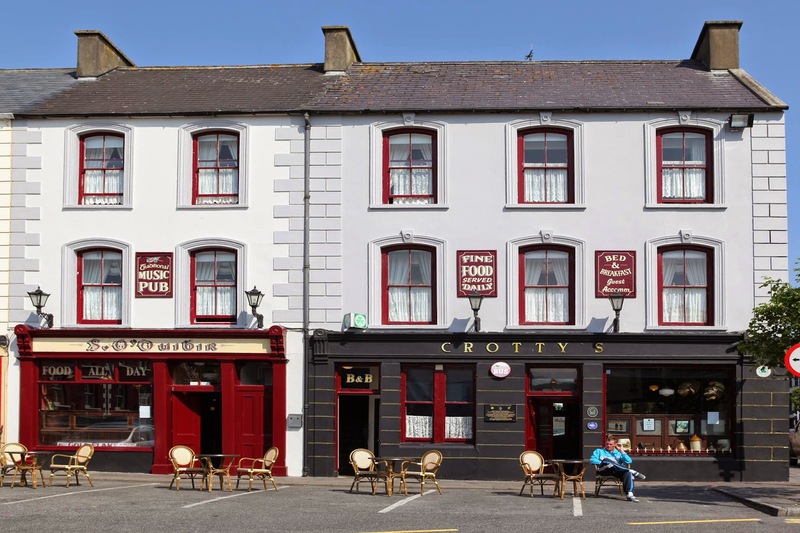 Crotty's Pub & B&B offers a choice of single, twin, double or queen beds overlooking the picturesque town centre of Kilrush in County Clare. Our bed & breakfast features 5 ensuite bedrooms, with bathroom or shower. Each bedroom has been individually decorated with fine fabrics and beautiful antique furniture. The bedrooms are both comfortable and furnished in period style. Kilrush is located at the mouth of the River Shannon looking out onto the Atlantic Ocean. Kilrush Creek Marina welcomes yachts from all over the world. Deep sea angling and onshore fishing can be arranged from the Marina. The Shannon Estuary is home to Ireland's only known resident population of Bottlenosed Dolphins. Taking a boat trip from Kilrush offers you a unique oppurtunity to observe these wonderful animals in their natural habitat. Boat trips to the ancient monastic site of Scattery Island are also available. One can play parkland golf in Kilrush or on the challenging links courses at Doonbeg, Lahinch or Ballybunion. There are beautiful clean beaches within a short distance and very pleasant woodland and coastal walks. Eastside Coach House offers bed and breakfast accommodation in the village of Mapledurwell near Basingstoke and Hook/Odiham - a quiet idyllic location surrounded by beautiful hampshire countryside yet only a 5 minute drive to the hub of commerce in Basingstoke. This is a large family bed and breakfast on the Basingstoke Canal - Little Tunnel lies a short walk away and the River Lyde flows beneath the property serving watercress beds and trout farm. A hearty Breakfast is served in our character dining room or farmhouse style kitchen by Le Chef Michael! We also offer regular guests a microwave facility and a laundry facility. Close to the B&B are two sports centres together with an Ice Rink/Ten Pin Bowling. Golf Riding Fishing and Shooting are also available. There is also The Anvil Concert Hall and The Haymarket Theatre in the town centre for a special evening's entertainment.